In 2011, the Peace Corps celebrated their 50th Anniversary. Ever since 1961 when President John F. Kennedy created the program to aid developing countries, the Peace Corps has become stronger every year. History alumnus David Wessel ’62 was the first Peace Corps Volunteer from the state of Louisiana, with his first trip as a volunteer from 1962 - 1964 to Colombia. As a Loyola student, David was uncertain what to do after he graduated. Majoring in history with a minor in sociology and political science, David had many paths he could take. However, after receiving a telegram to join the Peace Corps, David made the decision to join one of the first groups sent in the new program. After applying and taking a test, David was selected to participate in an eight-week training program. 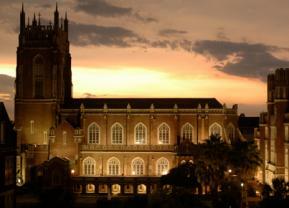 His acceptance letter was even posted on the bulletin board in front of the office of Fr. Robert L. Boggs, S.J., dean of students at Loyola during the time, in order to encourage other students to support the program. Upon completion of training, David was given two weeks to say goodbye to family and pack up his life before heading to Puerto Rico for more than a month to complete outward-bound training, a rigorous survival and fitness training program. “We had to swim in the ocean with our arms and feet tied,” says David. After outward-bound, David headed over to his Colombia site, where he would train just one week, then spend the next two years working and living in the country. In Colombia’s very cold environment, David worked at his site as a rural community developer, implementing programs that the town villagers wanted to create. In the small village David was placed, only about 5,000 lived and worked, which included a larger city and market place and many other smaller villages. David says he helped the villagers put together a tomato co-op, latrine program, and helped build a road for better farm product movement to and from the more rural areas and the more crowded villages. David says he is most proud of the project he helped create with a group of young women in one of the villages in which he lived. Together, they created a small town library. With the town’s priest on board, 500 books were donated and the building next to the local church became the new town library. 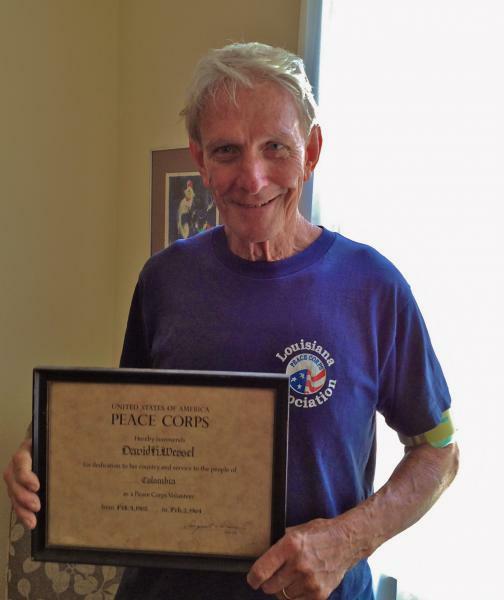 When he returned to New Orleans, David decided to help form the Louisiana Peace Corps Association (LPCA) for Returned Peace Corps Volunteers (RPCV). The LPCA organizes service and social events to help RPCVs share stories from their experiences, continue to serve others, and have as much fun as possible. LPCA has put on an annual event in October called “Rebuilding Together,” which helps refurbish housing for the elderly poor in New Orleans. While David served as the LPCA president from 1997 - 2000 and held roles as vice president and newsletter editor, he continues to serve as the director at large to this day, a position appointed to him after Hurricane Katrina when experience with LPCA leadership was greatly needed due to the influx of RPCVs that flooded the New Orleans area. In 2001, earthquakes hit El Salvador twice in two months, leaving destruction and devastation throughout the country. David was called to come back as a Peace Corps response volunteer where he would be a construction supervisor for six months helping to reconstruct housing. Although older than most of the volunteers there, David was welcomed despite the age difference. “To my surprise, Peace Corps hadn’t changed much at all, and the volunteers were just as ambitious and starry-eyed as I was in 1962,” notes David. After his service in El Salvador, David and his wife, Linda '62, decided to backpack through Central America. They ended the trip by meeting other Peace Corps Volunteers who were ending their two-year service in El Salvador, in Antigua Guatemala for Holy Week, eating and dancing in the spirit of the time and the ending of service. For the 50th anniversary of the Peace Corps, celebrations were held all over the country, including a large event held in New Orleans where David personally spoke about his experiences and history with the Peace Corps. David was then fortunate enough to go to the National celebration, held in Washington, D.C., where a few thousand people came together for a night to celebrate 50 years of Peace Corps Volunteers and their missions, including a representative from every country that has been visited by a Peace Corps Volunteer. The experiences and lessons learned through the Peace Corps have translated into David’s work. His motto is “service to the community is the best work of life.” With this belief in his heart and mind, David has continually worked for nonprofit and community-based organizations. David was executive director of Junior Achievement in Terre Haute, Ind., and Ft. Lauderdale, Fla., for about 13 years and also founder of Grace House of New Orleans, a free women’s treatment facility for poor adult females with drug and alcohol addictions, where he served as president of the board and executive director for three years. Additionally, David served for eight years as the volunteer coordinator of the RCIA program at Holy Name of Jesus Church and was involved in the founding of Perrier Club, a meeting place for various 12-step programs, such as Alcoholics Anonymous. While David says his experience with the Peace Corps changed his life for the better, he still reminds himself that he learned some of his greatest lessons from the community at Loyola. David will continue using the lessons learned during his Peace Corps experience throughout the rest of his life, while also continuing to be a proud member of the Loyola and New Orleans community he loves dearly. Kate Trotter ’14 (marketing) worked as the publications intern for the Office of Marketing and Communications during summer 2012. Submitted by Rita Wessel (not verified) on Thu, 08/09/2012 - 14:47. I am sooooooooooooo Proud of you Dave. You deserve the finest of metals for your dedication to the human race. Even though you and I grew up Poor materialy and Spirit. We were not poor in heart. Contratulations on your great achievements not just in the Peace Corp but in life itself and in your children and wife. Submitted by Father Michael Burke, O.P. (not verified) on Thu, 08/09/2012 - 03:00. I just read your excellent article about David Wessel's work with the Peace Corps and other projects helping people here in New Orleans. I have known David since I was fourteen when we both attended St. Patrick's High School on Miami Beach. Later we both transferred to a newly built all boys school, Archbishop Curley, in Miami, now Archbishop Curley Notre Dame which includes Notre Dame Academy, the girl's counterpart. Your article taught me so much about David's generous and other centered life. It is an amazingly thorough and inspiring article and I feel privileged to know David and learn about things in his life I never knew. Thanks so much for writing this article and I am sure many people will be inspired to give of themselves to others and find meaning and joy in service to others. Father Michael Burke, O.P., D. Min. Submitted by Anonymous (not verified) on Thu, 08/09/2012 - 01:10. I am very oroud of my kid brother for his years of service to those who really do need help both in this country and abroad. This is why Americans are and always have been the gretest caregivers in the entire world. No lack of Social Justice amongst the Majority of U.S. Citizenry despite shameful criticisms to the contrary!!!!!! Brother Joe.